Climate change appears to have been a significant driver of human evolution, report researchers writing in this week’s issue of the journal Proceedings of the National Academy of Science (PNAS). Studying deep sediment cores from Lake Malawi in Africa, Syracuse University professor Christopher Scholz and colleagues found evidence to suggest that the transition from a long dry period susceptible to extreme drought to a stable, wetter climate may have stimulated the expansion and migration of early human populations. Bathymetric map of Lake Malawi with locations of two 2005 drill sites. Small images to right are seismic reflection profiles acquired over the two core sites. Bathymetric contour interval is 100 m. Drilling operations mobilized from Chipoka, and the project was resupplied from the ports of Nkhata Bay and Chilumba. 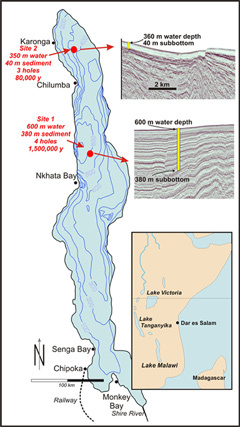 The authors say that a series of “megadroughts” that occurred in the region 135,000 to 75,000 years ago caused extreme drying of Rift Valley Lakes. During the most severe drought periods, Lake Malawi’s water volume was reduced by at least 95 percent while water levels fell to below 15 percent current levels. Other African lakes dried out completely and populations of African plant and animal populations fluctuated dramatically. The cores show that around 70,000 years ago, the climate stabilized and became much wetter, evidently creating conditions favorable for human populations, which expanded and eventually spread out across the globe. “Such climate change may have stimulated the expansion and migrations of early modern human populations,” write the authors. The results appear to support the “Out Of Africa” theory the humans arose in Africa and subsequently colonized the world during one or more migrations rather than the multiregional hypothesis for human evolution. Human evolution linked to climate change says study (September 6, 2005) New evidence suggests human evolution was caused by specific periods of climatic change in Africa according to research presented at the Annual Conference of the Royal Geographical Society. These climatic influences played a crucial part in enhancing human development says Dr Mark Maslin, Senior Lecturer in Geography at University College London. New findings suggest that during the long-term trend of desertification in Africa over the last 2.7 million years, there were clearly identifiable wet and humid periods. According to Dr Maslin, this is the first study to identify the presence of a series of ancient lakes, some more than 100m deep and over 100 square kilometers in size at critical times when humans first appeared.